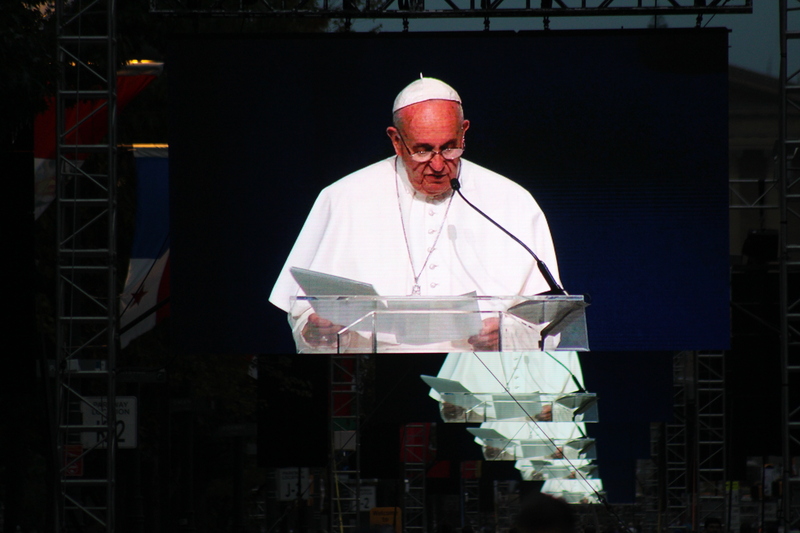 When Pope Francis, the international leader of the Catholic Church, visited Washington, D.C., New York City and Philadelphia from Sept. 22-27, humanities teacher Melissa Whelan devoted three days to experience this historic event. Whelan began planning her trip in the summer of 2015 when she heard that Pope Francis was coming to America. First, Whelan obtained a ticket from a friend to see the Pope at Central Park. On Sept. 25 at 10 a.m., she caught a train to Manhattan where she walked 33 blocks and stood in line for three hours to catch a minute glimpse of Pope Francis riding in the Pope Mobile through Central Park. In order to be further connected to the Pope and his message, Whelan took a pledge with the Archdiocese of Washington, D.C., to do a service activity in honor of Pope Francis. Promoting solidarity and demonstrating further dedication to her faith, Whelan returned to Tinton Falls, NJ late that night to facilitate the Trinity Hall students at the Cardboard Box City event (see “News” article), where she joined the students in sleeping overnight in the cardboard shelters they constructed. Upon waking up at 7:30 a.m. on Saturday, Sept. 26, she drove to a campsite in western New Jersey where she assembled a tent and then took a train to Philadelphia. Whelan walked to Independence Hall to hear Pope Francis speak and to volunteer. She stayed all day and assisted the Papal team by interviewing people, taking pictures, directing people to their ticketed seats and answering questions. 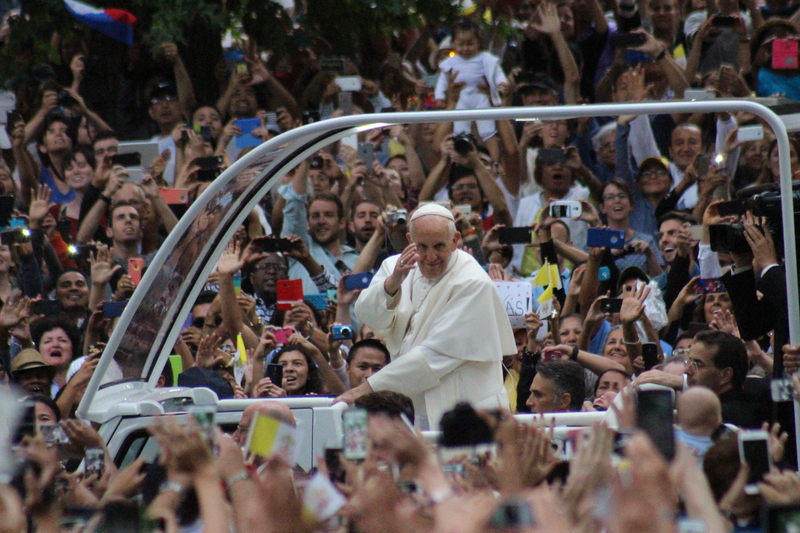 When the Pope resumed his tour by travelling through the city in his Pope Mobile, Whelan helped with crowd control and subsequently earned a front-row viewing spot when the Pope drove by. She later volunteered at the triennial World Meeting of Families in Philadelphia, the main reason for the Pope’s trip to the U.S.
That night, Whelan took the train back to the New Jersey campsite where she slept for the night. The following morning Whelan dissembled her tent and returned to Philadelphia where she stayed all day yet again to assist with the Papal Mass, which took place on the Benjamin Franklin parkway. “Even though my weekend was packed with events, I was so touched by Pope Francis that I wasn’t that tired,” said Whelan, who has had the honor of seeing Pope John Paul II and Pope Benedict in person as well. “Pope Francis was like Pope John Paul II in terms of the crowd getting very excited to see him.” Whelan brought the excitement of her experience back to Trinity Hall to share with all of her students. October 29, 2015 in Archives.